Many times I choose to drink teas based on their flavor, but the caffeine level in my tea can also be a deciding factor. Let’s explore the range of caffeine in tea types to help you choose the right caffeine level in your next cup. One of the biggest factors in determining caffeine in tea types is oxidation. Oxidation is the process of oxygen in the air reacting with the enzymes in the tea leaves. The longer the tea is processed for oxidation, the higher the level of caffeine in the tea. This process affects the color and flavors of the tea as well. Black tea is the most heavily oxidized type of tea to come from the camellia sinensis plant. Its dark color, full-bodied flavor, and decent caffeine level makes it a good choice for breakfast. 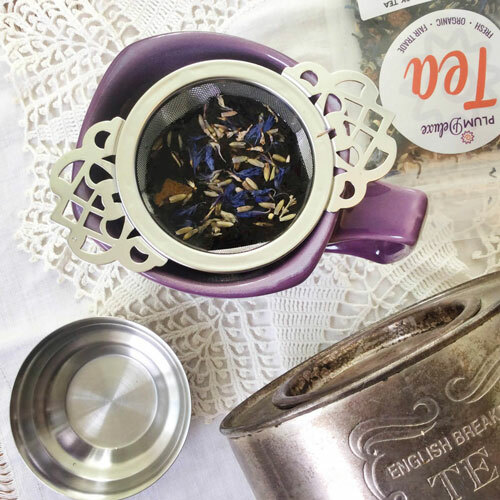 Earl Grey teas are typically made with black tea, like Delightful Morning lavender Earl Grey. For a bright breakfast blend, try Fog Cutter Irish breakfast, which adds a pop of lemon alongside the malty tea flavors. Or keep it classic with the creamy vanilla House Blend black tea. While matcha powder is made from green tea, it has a unique brewing process and caffeine profile. Unlike brewing a tea and discarding the leaves, matcha tea powder itself is made up of ground tea leaves; in consuming the powder you consume the entire tea leaf. This is why matcha provides such a big boost of caffeine and benefits like antioxidants. This high level of caffeine is important to know if you are paying attention to the level of caffeine in tea types that you brew at home. Guayusa or maté teas are not made from the same camellia sinensis plant as black tea or other teas. Instead, they come from a type of holly plant and that functions as a natural stimulant, regardless of oxidation levels. Teas with these plants have a high caffeine content, though it is a different type of caffeine than what you find in coffee. Many find it to be invigorating without the frustrating coffee “buzz.” If you need a big kick of caffeine, try Raspberry Revitalizer for a bright and fruity maté tea. 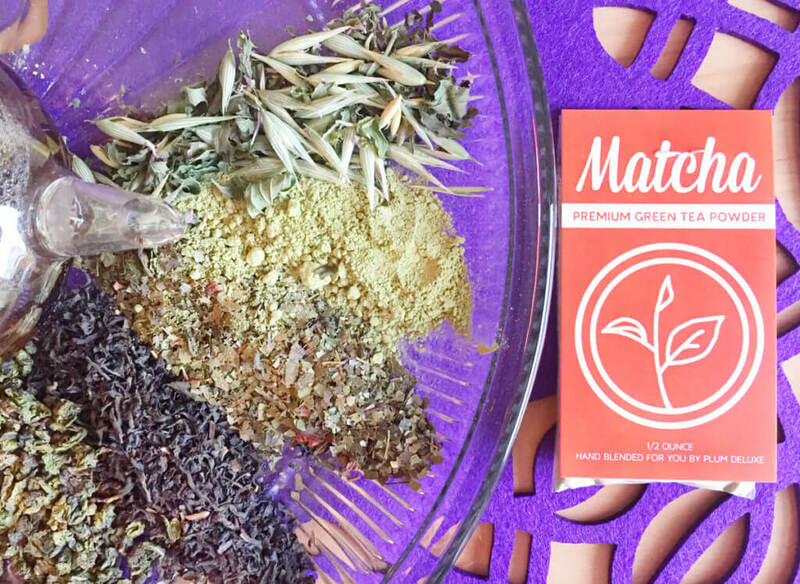 Or try Stargazer Maté Chai for a sweet and spicy blend. If you are looking for guayusa tea, check out Contemplative Blend, which features a twist of citrus. Pu’erh teas are pressed into cakes and fermented, which produces similar results to the oxidation process. This aging process helps give pu’erh teas their trademark smoothness and rich flavors. 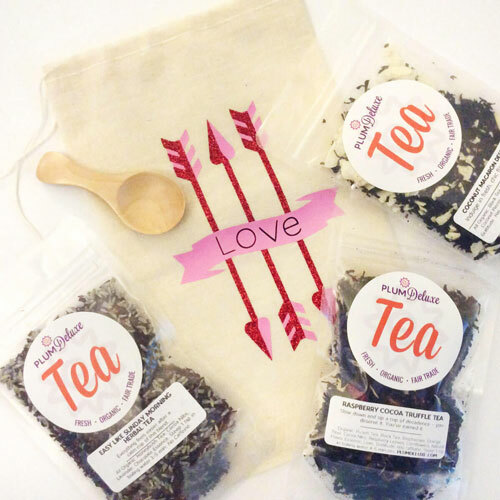 The Vanilla Rose heart-shaped tea cakes are a great place to get started with pu’erh tea. Chai fans will love the rich earthiness of the sweet and spicy Rainy Day pu’erh. Halfway between black tea and green tea on the oxidation scale, oolong teas have a medium level of caffeine; they maintain some of the darker roasted notes of black teas, and some of the lush vegetal notes of green teas. 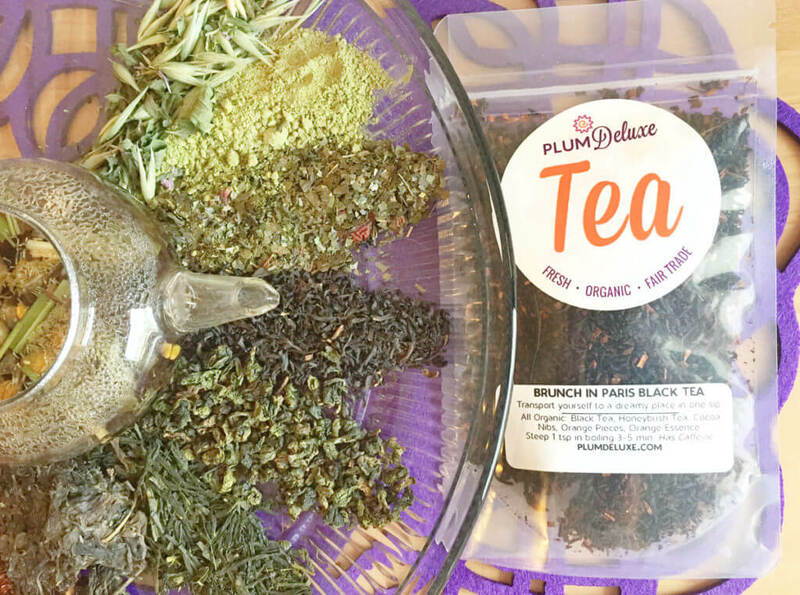 This flavor profile makes oolong teas great candidates to blend with a variety of sweets and fruits. 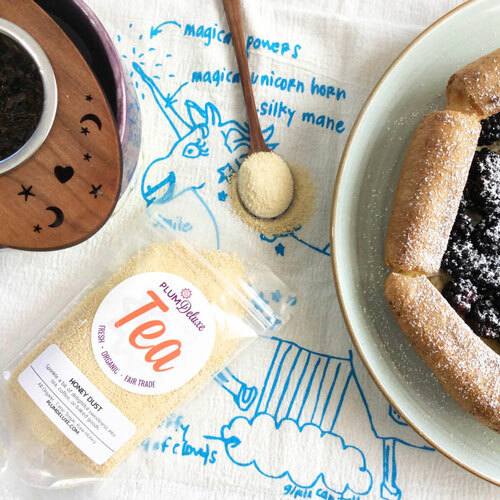 Currant Conversation pairs the tea with sweet-tart currants and a hint of vanilla. Peaches N’ Cream oolong tastes like a peachy dessert. With its medium caffeine level, Pick Me Up Oolong is great to brew in the afternoon when you need a sweet maple and almond cup of tea. If you are paying close attention to the caffeine in tea types that you drink, you might already know that green tea has less caffeine than black tea. 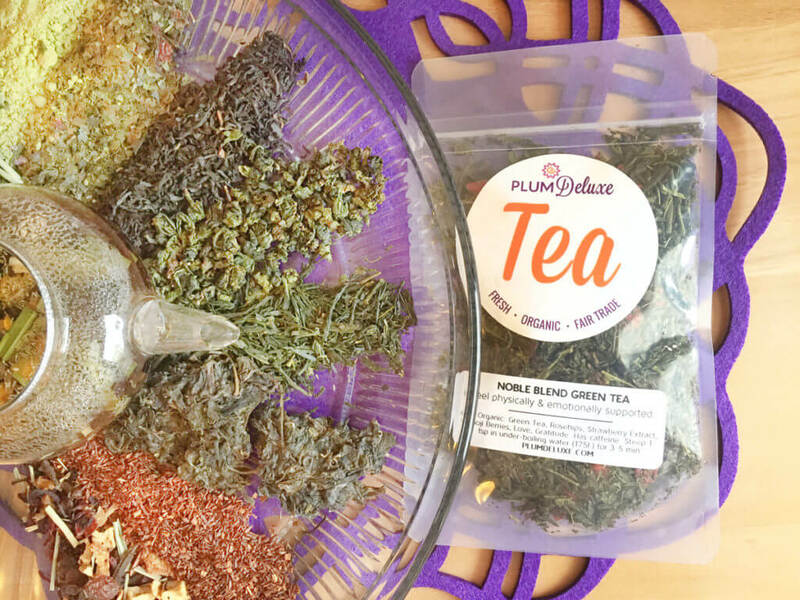 With little to no oxidation, green teas preserve more of their natural grassy flavors and contain a lower level of caffeine when steeped. Hope Blend combines the fresh notes of the green tea base with floral jasmine buds. Abundance green tea blend goes a more tropical route with passionfruit and elderflower inclusions. And if you want an Earl Grey without as much caffeine, try Queen’s Blend for a bergamot and vanilla brew blended with green tea. Similar to green teas, white teas have little to no oxidation. Likewise, their caffeine content is much lower and their flavors are much more delicate. Known to be rich and buttery, white teas pair well with gentler fruits. 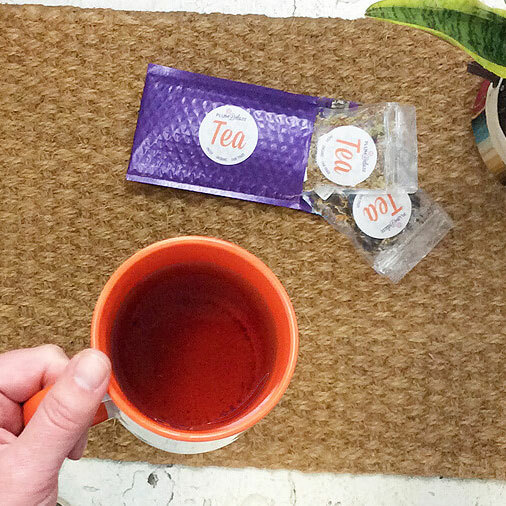 Tea Break blend pairs white tea with honeydew melon and a hint of tangerine. Afternoon High Tea makes you feel like royalty with delectable peach and pear flavors alongside the white tea. With its low caffeine level and champagne flavors, Candlelight Blend is perfect for romantic evenings or after-dinner celebrations. 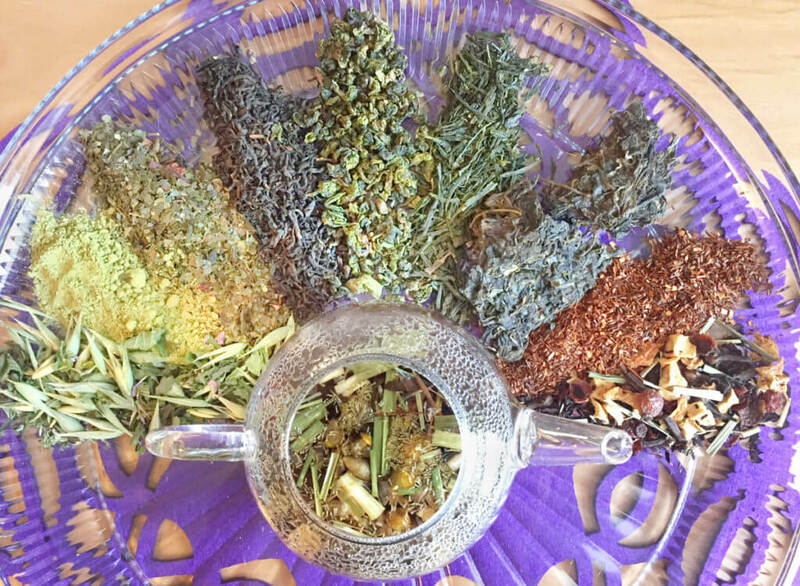 Herbal infusions — aka tisanes — are naturally caffeine free and are made with fruits, herbs, or non-stimulating plants like rooibos or honeybush. 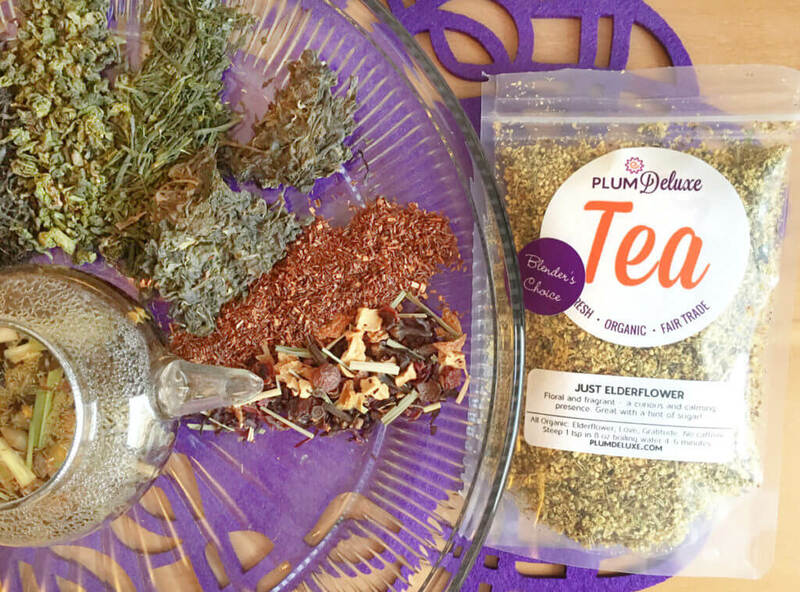 These blends can be brewed at any time of day to offer comfort and health benefits without the rush of caffeine. For a rich and chocolatey caffeine-free dessert, brew up a cup of Chocolate Hazelnut Dessert Blend. For a full-flavored, juicy, fruity blend, try Happy Hour — it’s delicious iced as sangria or part of a fruit punch at your next party. For a bedtime tea that goes beyond the chamomile flavor, try Tranquil Dreams with tart rosehips and cooling spearmint. 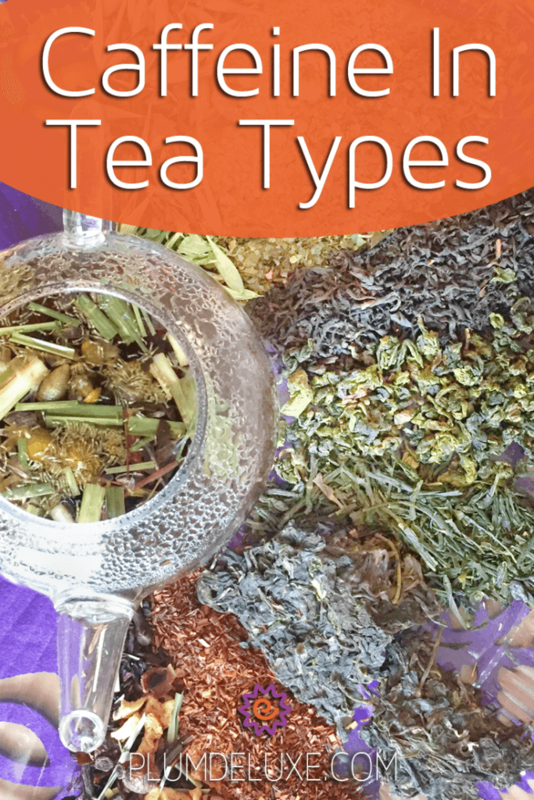 There is a wide range of caffeine in tea types, and also a wide range of teas. For every occasion or mood, you can match it with the perfect cup of tea and the perfect level of caffeine.